I could have gone to see Queen with Paul Rodgers back in 2005/6, but I honestly did not like this pairing. If I did go, I would have been disappointed. My impression of the Youtube videos of this pairing were not positive, and the reviews I read supported my thoughts. To leave the island must mean I really must love the band to death in order to hear their music live and unfiltered. They had to represent my youth. Back then, there were only two bands I took an immediate liking to: Queen and KISS. Ever since I heard about Adam Lambert taking on the mantle, I wondered: could he? I avoided watching American Idol but when I heard about Queen and KISS appearing, I could not resist. I saw that Lambert has the stage presence needed to pull off being there with the greats. Flash forward to now, he’s come a long way to be there in a big venue concert. 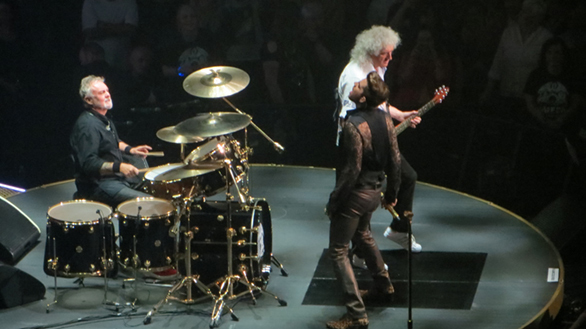 To see Brian May, Roger Taylor and their support crew of Rufus Tiger Taylor, Neil Fairclough and Spike Edney is finally a completion of a quest. To see them play with Lambert may well be like discovering a Holy Grail that can bridge generations together on stage. At this Vancouver, B.C., concert or anywhere else, travelling afar to experience this special kind of magic is well worth it. A Tale of Two Geeks: Trying to get to Cineplex’s Great Digital Film Festival! E: Gen X’ers, geeks, Gen Y’ers and nerds should unite! Nearly 50 years of pop culture cinema is being offered at the Great Digital Film Festival, which is playing all across Canada in select Cineplex Odeon theatres (January 31 to February 6). 21 films will be playing throughout the day for one week, and if James and I do not collapse from exhaustion (there’s only so much my buddy’s old age can take), we may take in more than five films of this mega-extravangza. The one thing I find interesting is that while I know it was not intentional, this show takes place right before the Victoria Film Festival.